For my last couple AltEnergyStocks Columns, I’ve been taking a step back and looking at how we can get an understanding of the broad trends of energy technologies. Last week, I added to the Visual comparison of Electricity Generation Technologies I did last spring with a new Visual Comparison of Transport Fuels. Following up, today I published a look at the varius solar technologies through the lens of their applications. Before we go back to looking at trees, I hope you enjoy this look at the forest. A couple weeks ago, I suggested to Bill Paul at Energy Tech Stocks that he interview Todd Litman of the Victoria Transport Policy Institute. As an investor, I have yet to figure out a way to make money from Mr. Litman’s ideas, but as a citizen of the planet, I see his ideas as the best ones available for quickly and painlessly imporiving our society’s well-being while also reducing emission and oil consumption. So I’m happy to say that now there is one more place you can read about pay as you drive insurance, and other Win-Win emission reduction strategies. I’m bullish about the battery industry, because I fee that rising oil prices and consumer awareness will lead to accellerating adoption of hybrids, plug-in hybrids, and electric vehicles over the next decade. So I’ve been researching the battery industry, and trying to look for companies that can benefit without being tied to a single battery chemistry, since I doubt the conventional wisdom that some company will perfect the Lithium-Ion battery, and that will be the solution for all mobile energy storage. I just did a write up on one company that I think not only has technology that is applicable to a wide variety of chemistries, but it’s also selling for less than what I think its assets are worth. The company is Electro Energy Inc. (EEEI), and you can read more by clicking here. I’ve accepted an offer to write an investment column for Smart Energy Living, a quarterly magazine put out by the Colorado Energy Science Center, which focuses on clean enrgy solutions for homowners. I’ve been a subscriber since I arrived in Colorado in 2005, and I find them an excellent resource for home imporvement. They have plans to go national with the next issue, and recruiting me to write for them is part of that move. The column will tentatively be called “Greener Money” and will focus on helping small investors green their portfolios. You can sign up for a free copy here. If you read my blogs, there probably won’t be a lot that you’ll learn from my columns, but if you’re interested in energy efficienct home imporvement, it’s well worth getting for the other articles. The Denver area Tour of Solar Homes takes place in less than a month, and this year you can preview some of the buildings involved online. The 2007 Tour of Solar Homes will take place on Saturday, October 6 in Denver and most locations around the state. However, some of the activities are slightly different. The Boulder tour will take place on Saturday, September 30. And the tour in Pueblo will span two days: October 6 – 7. See a complete listing of solar home tours in Colorado on the American Solar Energy Society Web site. 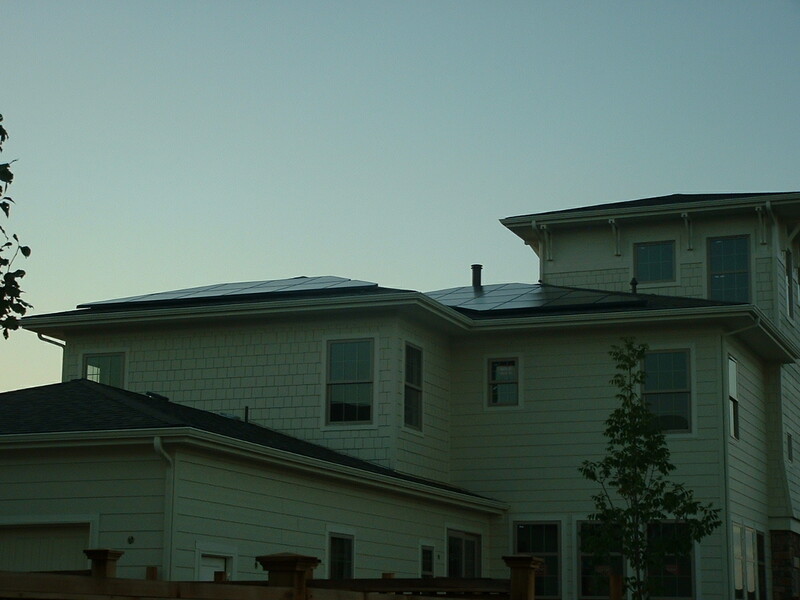 Outside of Colorado, people you can find tour in your own community by visiting the National Solar Home Tour website. CRES needs volunteers to help with the Denver Metro-Area Tour of Solar Homes on Saturday, October 6. If you step forward, you will assist homeowner with visitors. There are two shifts: morning from 8:30 a.m. to 12:30 p.m., and afternoon from noon to 4 p.m.
workshops take place at the National Renewable Energy Laboratory (NREL) Visitor’s Center at 15013 Denver West Parkway in Golden, which is two blocks west of the Denver West Marriott at I-70 and Denver West. Want to roll a Prius into your mortgage? 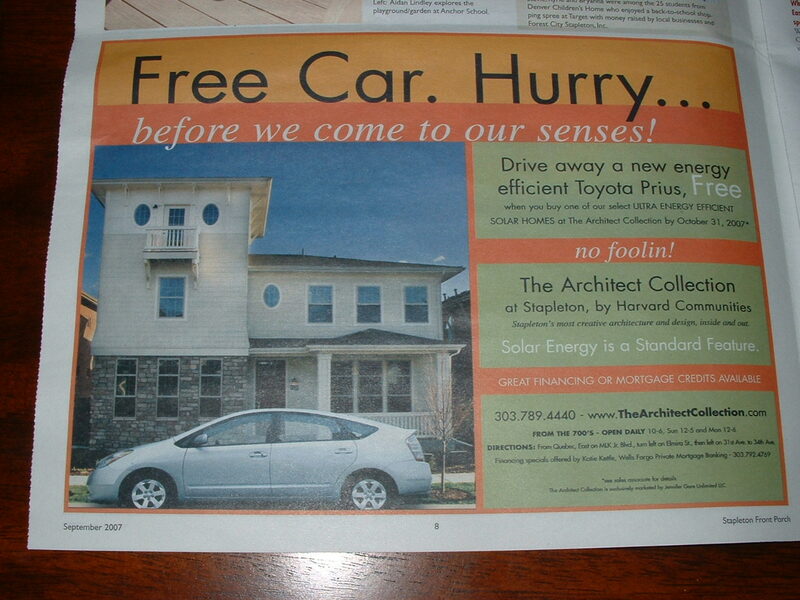 Now, you can get a free Prius with the standard solar you get on Harvard Communities’ (massively overpriced) Architect Collection homes. From an economic perspective, it makes a lot of sense for the builder to install solar; it costs them a lot less to do it than people who have to retrofit. But what’s the logic in having the builder fill your garage? These developers (especially the high end ones- these’ll set you back $800K) will do anything to avoid having to lower their price. Personally, I think they’re smart, people are more interested in buying things for status than practicality. The world is crazy, but I shouldn’t complain. It may just get some people out of SUVs and into Hybrids. But it does bother me that the most important energy efficiency things Harvard Communities is doing are quite cheap (good insulation, sealing the house well, using efficienct appliances) but it’s the splashy expensive stuff like a free car and PV that gets all the press. It makes people think that you have to spend a lot of money to be energy efficient. You don’t, but it’s a belief that is liable to keep coming back to haunt us for a long time.